Schwinn Easy Steer Kids’ Tricycle Just $45.78! Down From $100! PLUS FREE Shipping! You are here: Home / Great Deals / Amazon Deals / Schwinn Easy Steer Kids’ Tricycle Just $45.78! Down From $100! PLUS FREE Shipping! Hop over to Amazon to score this amazing Schwinn Easy Steer Kid’s Tricycle for just $45.78 down from $99.99 when you clip the savings coupon ($30.88) located below the price! PLUS, it’s FREE shipping! Isn’t it awesome? Every child remembers their first bike. Make those special memories with the Schwinn Easy Steer Tricycle! It has great features such as the trike’s high back seat and 3-point seat belt, provide the perfect combination of comfort and child safety. It makes learning to ride fun and easy, while the wide, long-lasting EVA tires offer a stylish look your child is sure to love. 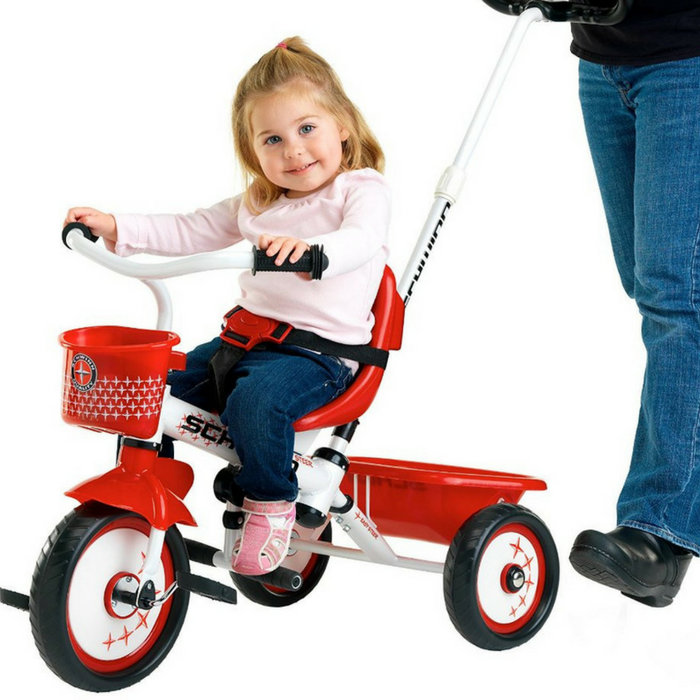 With a removable push/steering handle, adults are able to walk comfortably as they control the steering and speed of the tricycle. I’m sure your kids would enjoy this!